(Twelfth day). Up and to my office, where very busy all the morning, being indeed over loaded with it through my own desire of doing all I can. At noon to the ‘Change, but did little, and so home to dinner with my poor wife, and after dinner read a lecture to her in Geography, which she takes very prettily and with great pleasure to her and me to teach her, and so to the office again, where as busy as ever in my life, one thing after another, and answering people’s business, particularly drawing up things about Mr. Wood’s masts, which I expect to have a quarrel about with Sir W. Batten before it be ended, but I care not. At night home to my wife, to supper, discourse, prayers, and to bed. This morning I began a practice which I find by the ease I do it with that I shall continue, it saving me money and time; that is, to trimme myself with a razer: which pleases me mightily. Sir W.Batten: Mr Pepys, i have noticed some nicks in your face as of late, methinks you are a cheapstake that is trying to save a penny when this cut can get infected and cost you your life. "to trimme myself with a razer: which pleases me mightily"
It gets old fast, Sam. Up to his neck in business, but Sam still finds time to give a geography lecture. What does Bess intend doing with all this new found knowledge in maths and geog? Perhaps she's planning a Caribbean winter cruise. Did Sam not take up the invitation from Sir W. Pen, to attend his feast today, (12th day of Christmas), mentioned on the 3rd? Spoiler -Martin -you'll have to wait until tomorrow's entry. It is entries like this one that give the diary so much humanity and keeps me reading. There is not as much pleasure in knowledge unless you can share it with someone. It is even more pleasure when they delight in the knowledge too. These feelings are timeless and connect the modern reader so well to the 17th Century. Shaving oneself is a matter of control, not just saving a penny or two. Sam likes control. This is a small item that gives him more control. "I shall continue, it saving me money and time; that is, to trimme myself with a razer"
covered with little white pieces of tissue as he goes through the process of mastering this skill! When you taught me Geography, On the seventh of Jan'ary. Each new land a sweet surprise. When you taught me Geography. Cause you've opened up my door. You may find other romance. Congratulations Robert; I can see Fred and Ginger -- err, Sam and Elizabeth ... the "globeman" or the "mastman" as a solo tap dance? "my poor wife" is back again. "to trimme myself with a razer:"
I'm guessing this was a straight razor like my father used to use, and sharpened on a length of leather (as I recall -- doesn't seem likely) which was hung on the wall? 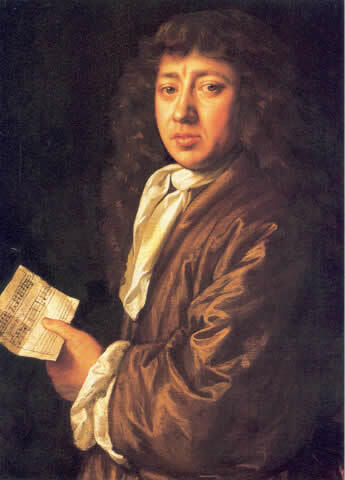 I hope Pepys had some good soap to use. Perhaps Will Hewer had been doing that in the recent past? Now Will was no longer living with Pepys it was complicated getting a shave in every day? Ahhhh, more questions never to be answered. It was a leather strop indeed, SDS. Wikipedia tells me a strop can be made of other materials such as canvas too, something I didn't know. In response to San Diego Sarah's question, Sam has occasionally referred to visits from the barber, including (at least on one occasion) twice in the same week. It's reasonable to assume that when he wanted a shave, he called in a barber. The only "razer" Sam could have had was a straght one. You bet he had to be careful! That's a lethal weapon. ‘strop, n.1 < Old English? < Greek στρόϕος . .
. . 3. A strip of leather (or of a special textile), or a strip of wood covered with leather or other suitable material, used for sharpening a razor . .